Carroll wants his players to do what they’re supposed to do, but he also wants them to reach a point where their instinct takes over, their experience and training reveal hidden passages, and they make plays other players wouldn’t attempt. Richard Sherman did the wrong thing. He wasn’t supposed to leave his receiver alone down the sideline, and he wasn’t supposed to break toward the middle of the field, and he wasn’t supposed to intercept a pass in the end zone. But he did the wrong thing, and by doing the wrong thing, he not only saved the Seahawks’ win at home against the Rams in 2012, he actually did the right thing. What he did, on a fundamental level, was break the rules. But Sherman, a noted mental ninja, had an idea before the snap where the Rams’ quarterback was going to throw; he just had to wait in the weeds until he started his motion. It was the kind of moment Seahawks coach Pete Carroll builds toward, a paradox he creates: He wants his players to do what they’re supposed to do, but he also wants them to reach a point where their instinct takes over, their experience and training reveal hidden passages, and they make plays other players wouldn’t attempt. He talked about that idea on a recent podcast with psychologist Michael Gervais. Earl Thomas is a classic example. Early in his career, he was unpredictable and reckless. He wanted to make big plays every play and often wound up out of position. Carroll said Thomas cost the Seahawks hundreds of yards as a rookie. But the older Thomas got, the more disciplined he became. He mastered both the defense at large and the nuances of his job — angles, footwork, a quarterback’s body language. Out of those fundamentals, over time, emerged the creativity Thomas now calls on to make big plays. Sometimes that creativity backfires, as it did in 2013 when Thomas guessed the wrong way against the Texans. He thought the throw was going one way, ran there and allowed an easy touchdown on what looked like busted coverage. The same could have happened to Sherman against the Rams. But that’s the cost of big-play hunting. One example: In the first quarter against the Panthers last year, Carolina had two receivers run routes in Thomas’ area. He jumped on the receiver running the underneath route, but at the last moment, he spun around, clung to the second receiver behind him and picked off Cam Newton’s pass. Thomas comes by his creativity naturally. Someone sent him a drum set when he was young, and he instinctively started playing at his grandfather’s church. All feel, all rhythm, no lessons. The more he played, the more creative he became. He relates that musical experience generally to football. One of the best ways to think about the Seahawks’ creativity is through the experience of younger plays. Sherman breaks form all the time. Bennett and Thomas and Doug Baldwin and Bobby Wagner do, too. “We’ve mastered painting inside the lines,” Sherman said. The problem is that younger players see their rule breaking without understanding why they’re doing it. When Sherman peels off his receiver, it’s from experience; he has calculated the risks. When Bennett ignores his assignment and improvises, he has a good idea of what’s coming. 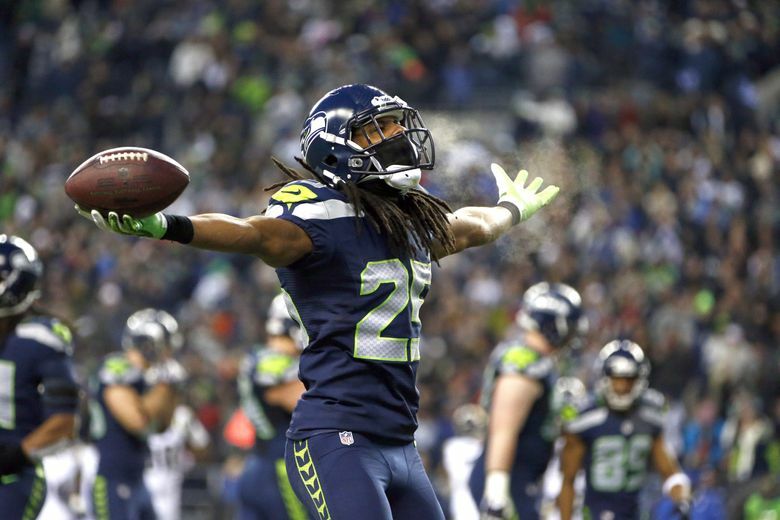 Chandler Fenner, a former Seahawks defensive back, said young corners have to be careful watching Sherman because he operates in a different space. What’s different with Sherman, Bennett and most of the other rule-breakers: They understand what they can’t do. They know what to avoid. It’s a central tenet of creativity: Not every risk is worth taking, not every instinct should be acted out. Carroll commonly references dancers and musicians. They practice and practice, repeating the same chords or routines until it is ingrained in them. It’s monotonous at first, but once they reach a certain point, they’re free to expand. On Mondays, when coaches grade players, they still correct guys who broke the rules and won. But in the moment, on the field, Carroll wants his players to know that doing the wrong thing can sometimes be the right thing. • The Seahawks re-signed running back Zac Brooks to their practice squad, releasing receiver Antwan Goodley to make room. Brooks was a seventh-round pick in the 2016 draft out of Clemson. Time staff reporter Bob Condotta contributed to this report.